In addition to the strawberry plants, we've planted other fruit plants that we are hoping will take off next year. Here is one of the two blueberry plants. The plants haven't grown much at all since planting them. It grew a few leaves, that's about it. If you ask me, this plant looks pretty sad. The leaves aren't even "green". Does anyone know how many years it takes for these plants to really get larger and start producing blueberries? Also, what should I do about the winter? Do I stop watering it after the first frost? Should they be "covered" and protected like fig trees? Here in MS, we don't do anything to them. We actually had 3 snows in our area which is very uncommon. But, mine came thru fine. Blueberries don't like wet feet, but they do like to be watered regularly. I'd give them a dose of slow release fertilizer and mulch them. Even small bushes should set fruit within a couple of years. It takes quite a while, several years... BUT... in the meantime those bushes are really pretty, I think a great addition to regular landscaping, so enjoy the other benefit of the bushes while you wait for the fruit! I don't know about your particular climate - but in my climate, we mulch with some acidic wood chips (like evergreen) to make sure the soil is feeding the berries and the roots are protected. We don't cover them on winter - they have beautiful red branches in winter which is why I plant them right in my front gardens. But it is much milder here. Mine took only a year to produce berries, but it took 6 years to get a lot of berries. Blueberries are a long term project for sure. I think I killed one of my blueberry bushes and the other two look about like yours. I think maybe the Japanese Redneck is right, maybe wet feet. I thought they weren't getting enough water but maybe it's to much. Why are my Blueberry leaves turning yellow? Iron deficiency (chlorosis) is a very common deficiency in blueberries. It is first exhibited by younger leaves and spreads to the entire shoot. Yellowing occurs between veins, while veins remain green. Leaves may turn completely yellow or, in severe cases, reddish-brown. 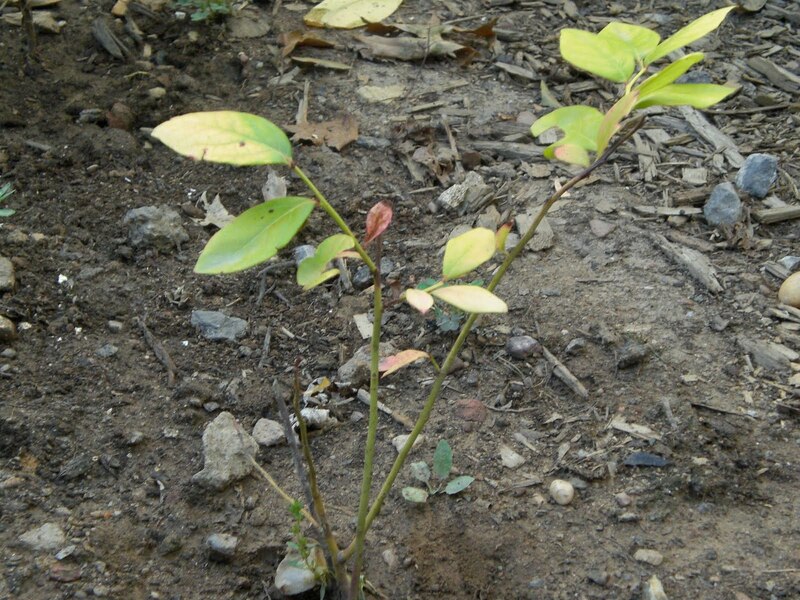 Blueberry plants are not able to remove iron from a high pH soil. Iron is much more available at a lower soil pH. To correct iron deficiency, apply iron chelate to the soil or to the leaves. The more permanent and less expensive solution is to lower the soil pH with sulfur to the recommended soil pH of 4.2 to 5.2. Manganese toxicity can occur when soil pH is too low or too much acidifying material has been used. Symptoms are similar to those of iron deficiency. A foliar analysis may be needed to determine the problem. I did not make a face about Staten Island. The zoo looks like fun. I wonder if they feed the animals the produce.